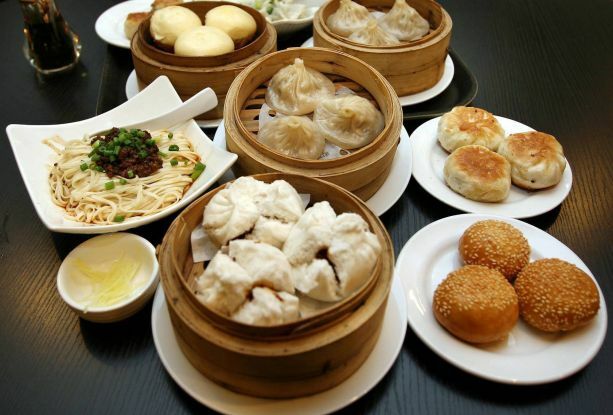 WHEN it comes to having good dim sum for breakfast, locals are spoilt for choice thanks to the number of restaurants catering to the dim sum crowd. Despite all that competition, Chuan Kwong Chinese Restaurant has managed to stand out with its variety and has become popular in Ipoh. This newly opened restaurant, along Persiaran Greentown 1 in Greentown business centre, serves Cantonese and Szechuan dim sum. Here, diners will discover how the Cantonese flavours and Szechuan spices mix delightfully together, all thanks to the highly skillful chef Alex Leong. Fluffy and tasty: Junnie Lai showing the tempting pau namely the minced meat dumpling (right) and steam custard buns. The restaurant was established by Alex, 25, and his brother Justin, 23, together with a good friend Steven Liew, 25. Alex and Liew are in the kitchen while Justin takes care of the dining hall attending to the customers. The Shanghai minced meat dumpling or siew long pau is the eatery’s signature item from the Cantonese dim sum range. This Shanghai dumpling is filled with delectable soup — a perfect accompaniment to the minced meat. “To eat this siew long pau with maximum enjoyment and minimum embarrassment, bite a tiny hole in the dumpling skin and sip the soup,” Alex suggested. Others recommendations for a good breakfast at Chuan Kwong are fresh prawn dumpling with celery, steamed siew mai with crab roe, crystal dumpling with scallop, mini egg-custard bun and mini steamed custard bun. From the Szechuan dim sum fare, the choice picks are steamed dumpling with minced meat and Szechuan seafood siew mai. In fact, there are more than 20 items to choose from. Its homemade noodles should be able to please all taste buds. One of the criteria of good steamed dim sum is the dumpling skin, it should be fairly thin and delicate and Alex’s more than 10 years of experience stands him in good stead when it comes to making the dumpling skin that is delicate yet manages to hold all of the filling in tidily. Alex revealed that his passion for dim sum, to be a good chef and to make good dim sum started at the age of 16 when working in a dim sum restaurant. “I wanted to learn more about dim sum and the changing trends, so I chose to work in big restaurants in Singapore and Kuala Lumpur,” he said, and after a decade of stints across the border, he saved enough money to invest in his own restaurant in Ipoh. Justin, meanwhile, left for Switzerland immediately after his Form Five and worked in a club. He was still there when his brother called and asked him to come home and join him in the restaurant business. Chuan Kwong Chinese Restaurant is more than just about good food, it is also a heartening story about hardworking youth leaving the comfort of their hometown seeking employment, earning and saving enough money to return home to start their own business. Regular customers of the restaurant are impressed not only by the food but also the fine example of the young restaurant owners because of their hardworking and enterprising spirit. Chuan Kwong Chinese Restaurant is located at No. 74, Persiaran Greentown 1, Greentown Business Centre, Ipoh, Perak. Tel: 05-253 3551. 10 copies of “Eatpoh – Ipoh’s Best Eating. Easily”, a 84-page food guide, courtesy of Haven Lakeside Residences developer, will be given out to Star readers on a weekly basis for the next 26 weeks, To receive this book, email us at metroperak@thestar.com.my to tell us their favourite eating place and its location in Perak.